in the surroundings of your home. The land surrounding your home already contains natural moisture. It must also properly drain sudden water flows from rainfalls, snowmelt, runoff from the roof, or even the watering of your yard. Your home may also be located in a floodplain or near a ground water table, making it so that your land quickly soaks up water. 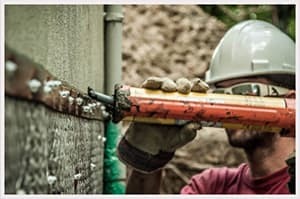 It is essential to protect your foundation walls according to the specifics of your property to ensure that your home stays dry. 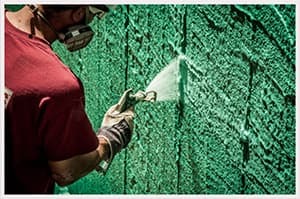 From a perspective of sustainable development and eco-friendly construction, the number 1 choice is definitely the product Rub-R-Wall! Why is it important to waterproof your foundations? Waterproofing for foundation walls is often overlooked by manufacturers in favour of a simple tarring, which is certainly economic but is not resistant to cracks and damage in the long run. Tarring is not enough if there is a constant presence of water and moisture around the foundation. Only waterproofing can counteract these effects. It is a life-long protection that you can provide to your home as well as your own health. This method is commonly used for foundation walls. Made up of a polystyrene panel expanded on each side connected to each other, which receives the concrete during casting. Stone foundation of small and large dimension joined together with mortar. Foundation made up of a series of hollow concrete blocks joined together with mortar. Technique used to make foundations completely waterproof in flood-prone areas. With the waterproof Rub-R-Wall membrane, your foundations are completely isolated from the ground. Elastic, it may restrain spalling concrete and even cracks reaching 3.2 millimetres (1/8 inch) in width. 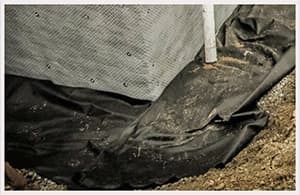 When the Geo-Wrap drainage board is placed over the Rub-R-Wall membrane, it protects the Rub-R-Wall against any risk of deterioration and improves the drainage of runoff water along foundations. Our Rub-R-Wall membrane is sprayed on. 100% waterproof, this hydrocarbon elastomer membrane offers exceptional adhesion. Thanks to its incomparable elasticity and waterproofing, the water and humidity of the ground can not infiltrate any more, even by capillarity or by cracks that can reach 3.2 millimeters (1/8 inch). Geo-Wrap is a composite of our high performance and extremely resistant drainage system. 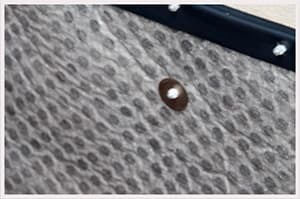 It consists of a three-dimensional polypropylene base on which a non-woven filter cloth is welded. It protects the Rub-R-Wall from any risk of deterioration and accelerates the drainage along the foundation walls. Thanks to its water-repellent capacity, it isolates the foundations. The moisture content of the basement is improved and the temperature is easier to control. 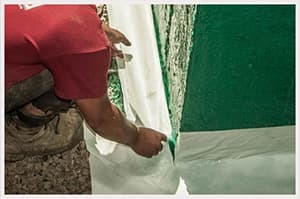 The non-woven filter fabric overlying our Geo-Wrap board allows us to preserve embankment to provide a path along the membrane and faster drying of the surrounding soil. Our sealant-finished trim prevents water infiltration between GeoWrap membranes, Rub-R-Wall and the foundation. The risks of condensation and mold between the components are thus completely eliminated. Geotextile membranes isolate gravel from soil, clay, or sand that constitutes backfill. It prevents it from mixing with water, circulating through the gravel and eventually clogging the drain. Our PolyWhite® adhesive foil is placed on the corners of the foundation walls. It eliminates any risk of infiltration into this sensitive area and ensures the flow of water to the French drain. 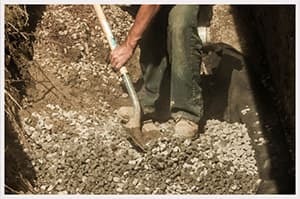 The gravel accelerates the flow of water to the drain and ensures the maintenance of a drier foundation base absent from any water pressure coming from the water table. 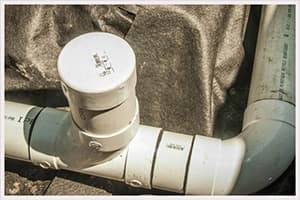 Our French drains are only made with 4-inch BNQ rigid pipes. These are much more robust, more durable, more efficient and easier to clean than flexible drains which are unfortunately often deformed or crushed by the pressure of the embankment or damaged or blocked by roots. Although it is a technique that causes pollution and is not as effective in the short or long term, tarring and the bitumen-based membrane are often proposed as a waterproofing solution. 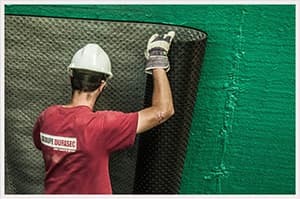 At Groupe Durasec we will offer you the Tar-Free Solution, in fact; the RUB-R-WALL membrane does not contain anything derived from tar. Tested in a laboratory, it will remain extensible and will keep its grip for a minimum of 100 years (ASTM D412, ASTM D2240 tests). After waterproofing work with the Rub-R-Wall membrane, there’s a lot less humidity in the air at their homes. In fact, while people who have a dehumidifier generally accumulate on average one tank’s worth of water per day, in most cases they now accumulate one every two weeks. Durasec’s exclusive technique offers you waterproofing that will protect your house from any risk of infiltration over its total lifespan.Ideally, this step will be taken when building the house, but if waterproofing has not been done at this time, it’s still possible to make this improvement at any time, regardless how old your house is. If you also combine this with a drainage system adapted to the flows on your land, you will be assured of giving your property a promising future.